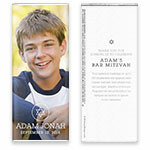 What better way to celebrate than with a candy wrapper featuring a full portrait photograph? 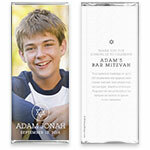 Our latest photo collection wrappers are the ultimate personalized favor! Photo Requirements: a) You must provide a high-resolution photo, b) Ensure the shape or orientation of your photo will fit well within the extra-tall rectangle shape of the picture area, c) Do not crop your photo - keep space around the subject to make sure there is enough room to fit the picture area. Design: Large photo with Star of David detail. Personalization: Name, date and a photo on the front, with title and message on the back.